There is plenty of evidence to suggest that investors are into self-harm: taking wrong-headed decisions that tear chunks out of the returns they might have earned if they weren’t so busy chasing performance. So how good would it be to own a diversified portfolio that takes most of the decision-making out of your hands, without diverting cash into the pocket of some shark-eyed advisor? Enter the Vanguard LifeStrategy funds. Each fund is a passive investing wrapper that contains a selection of Vanguard’s low-cost index funds. Instant diversification across a range of asset classes. An equity/bond mix to suit your risk tolerance. An off-the-shelf portfolio that’s ridiculously low maintenance. Automatic rebalancing that cuts out meddling humans. The headline equity allocation is a rough-and-ready indication of how risky a ride each fund may deliver in the future. An aggressive investor prepared to bear much stock-market-related pain might pick the LifeStrategy 80% Equity Fund in the pursuit of higher expected rewards. A more risk-shy individual would be down in 20% territory. Most of their assets would be in less volatile bonds and they would accept lower expected returns over the long-term as the trade-off. 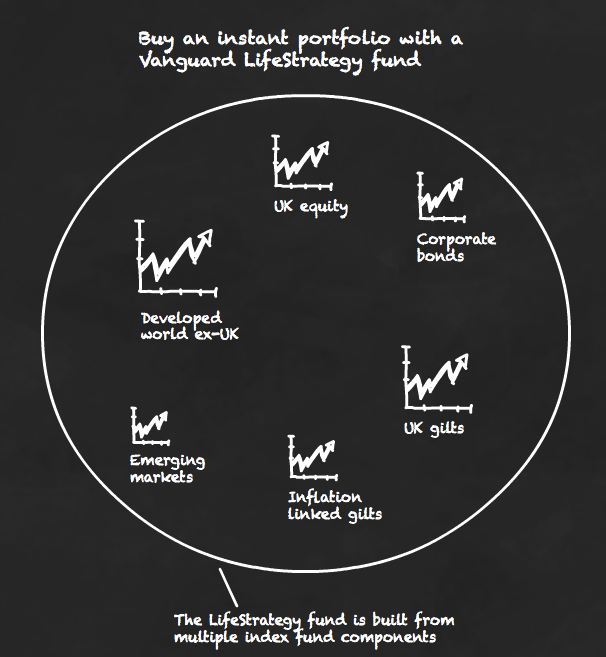 An individual LifeStrategy fund is essentially a bumper pack of Vanguard index funds that break down the total investment market into distinct asset classes. Almost half that 40% bond allocation is taken by an intermediate UK Gilt fund that blends short-term, medium-term and long-term government bonds for an average duration of 9.3. The 13.3% allocation to corporate bonds is pretty chunky, and can be expected to offer a greater return in exchange for more risk than if you were entirely in gilts. To round off the bond piece, there’s 8.1% in inflation-linked gilts. The UK equity index tracked is the FTSE All-Share. A 21% allocation provides the home bias that many investors instinctively reach for to insulate against currency risk. The FTSE Developed World ex-UK index is dominated by large cap stocks in the US, Europe, Japan and the developed Pacific Rim (mostly Australia). There’s 33.6% in there. The emerging markets allocation is a somewhat measly 5.4%. (Semi) technically speaking, to provide a sort of jangling set of master keys Vanguard has blended together the various FTSE and MSCI indices that govern these sub-funds to create its own so-called LifeStrategy indices. The other LifeStrategy funds maintain proportionally similar holdings between the sub-funds that compose the bond and equity asset allocations, but vary the total bond versus equity mix to juggle risk versus reward. In broad terms, each LifeStrategy fund captures the main benefits of a globally diversified portfolio, although they are entirely missing refinements such as commodities, property, and small-cap and value shares. Of course, that’s not to say you can’t pick up those asset classes elsewhere for yourself once the LifeStrategy fund has got you off to a good start. Unlike at Tesco, Vanguard charge you more for buying in bulk. The annual management charge (AMC) is an average of the underlying funds plus an administrative top-up. The quoted AMC of the LifeStrategy 60% fund is 0.31%1. That compares to a weighted average TER of 0.23%, if you held the component funds as separates. But the difference is not a whole hill of beans in the long run, even though I’m obsessed with cutting costs like an axe-wielding Tory Minister. You’ll also pay an upfront cost called a dilution levy. For once, this is a good cost as it’s designed to penalise market-timers switching in and out of funds like manic high-frequency traders. The dilution levy is meant to cover the transaction fees incurred by trading, and is paid back into the fund for the benefit of the buy-and-holders. The biggest hurdle for retail investors using Vanguard funds has always been dealing fees that play havoc with small, drip-fed contributions. But the LifeStrategy route elegantly side-steps the problem by enabling you to invest in an entire Vanguard portfolio for just one dealing fee. If you buy using Alliance Trust’s regular investing scheme, you’ll only pay a dealing fee of £1.50. That amounts to an acceptable 0.5% off a £300 monthly contribution. For my money, the best thing about the Vanguard LifeStrategy funds is that they minimise the input of hot-headed humans. Whether directing the flow of new monthly contributions or rebalancing the portfolio, there’s always a chance that our febrile brains can muck things up. How many times have I hankered over gold as it’s frothed and bubbled during the last 12 months? Equally, it’s not easy to make yourself sell down an over-performing asset just to fit in with your pesky asset allocation. These LifeStrategy funds provide a ready solution for meddlers. Just set up the direct debit and forget about it. The money flows into the predetermined allocations like water into irrigation channels. Rebalancing happens without you needing to lift a finger and so you’ve got built-in risk control that offers some measure of protection against the markets and yourself. Passive investors often style themselves as lazy investors and you’ll be hard-pressed to find a lower maintenance option than this at the cost. I personally don’t want to give up that level of control. I’ve enjoyed the process of working out my own asset allocation, researching my fund choices and tending to my investments. The act of rebalancing keeps me in touch with my portfolio and the market mechanisms that affect it. If I was more hands off I fear I’d lose sight of what I was doing it all for. But for many people investing is about as much fun as slopping out. So if you want to take the pain away, then take a look at the Vanguard LifeStrategy funds. As a lay investor I get the concept of investing monthly, ie when values drop your buying low and when they rise again your levelling out earlier losses. What is the risk in these passive funds when you are investing a 1 off lump sum. Is timing a consideration how do you avoid an initial loss? Or am I barking up the wrong tree. I have a memory of transferring a slow growing managed fund into a supposedly better performer and the .com bubble killed it, never really recovered. I understand passive is safer than managed, but how protected am I with a lump sum? @Simon — Passive investing isn’t safer particularly than actively managed, except in as much as you’re investing in line with the market (/benchmark) so there’s not the chance of a huge divergence that you might get in an actively managed fund if the manager goes on a bender (/decides to invest in some exotic asset class or gear up with lots of debt or what have you). In some cases passive funds may be riskier, if compared to a similarly exposed fund where a manager is temporarily holding more cash or lower-volatility assets, for example. The idea with passive investing is that you benefit from low costs, and from the fact that over the long-run manager decisions (such as that holding more cash I mentioned) seldom add enough value to beat that low-cost advantage. As for lump sum versus drip feeding, it’s a lottery. The odds are on your side, because *usually* the market goes up more than it goes down. But there’s no saying you won’t put the lump sum in just before a crash. I’ve not spent quite so much time mulling things over as Nick has. I’m 28/london, and on the back of what I’ve read on monevator, opened a charles stan direct account a couple of nights ago, with intention of putting 1k in to Lifestrat 100Equities Acc, and drip feeding in 50 or 100/month thereafter. Just getting in to good habits. Whenever I make a purchase from here on out, I’ll be thinking about Warren Buffet and his 1950’s sofa dilemma. Assuming the market takes a 30% dive at some point, I won’t bat an eyelid. As far as I’m concerned the money I’m putting in is written off for the next 20 years at least. If the market crashes and stays crashed, well at least everyone else around me will be in dire straits too. Does anyone know when Vanguard will be introducing Target date funds into the UK? I’m currently investing in a Lifestrategy fund and have read the ways to do this manually, but in the interests of not spending too much time looking at my investments, I’d love a one stop shop, to save me the worry and the temptation to mess with things. Hi I currently own the 80% LS fund and I was just wondering if it would be worth also investing in a fund with more global exposure like a global small cap? That move should make you a little more diversified and increase your expected return a smidge. The downside would be increasing costs a tad and a likely increase in volatility. Also a slight increase in the complexity of managing your portfolio. As with anything in investing it’s a balancing act and the outcome is uncertain, it’s a question of how you want to skew the characteristics of your portfolio. I have about £40k in a M&G UK FTSE Index tracker in an ISA. I really like the sound of these funds; would it be worth me transferring my ISA to hold one of these funds? Hey, the accumulator, Really amazed and what i’m reading. Found your superb site by way of the fantastic mr money moustache, and i’m so glad to see a british perspective on investments. 2) Second question is how can i find out about the ethics of the funds that are invested in, from a faith based perspective? So for example i know MSCI does catholic and islamic indexes to review what areas are being invested in, but i wanted to know if vanguard is okay or not to invest in from that usuary-averse background i’m coming from? i’m muslim and i can see that vanguard seems to be much more professional and easy to use than any other fund but i wanted to know how to check what they are investing in is in line with my requirements. I recognise that i may have flubbed up a lot in terms of using terminology incorrectly etc [a sure sign someone should not invest if they dont know what they’re doing] but i want a starting point to work with. So for instance if i knew that in order to get a LS fund i’d need atleast 1K (probably vastly underestimating, i imagine its something like 50k) then i could work towards that. secondly if the ethics are right, then also it would give me a bit of understanding that i could lock away a part of my money in this fund safe in the knowledge that 20 years down the line it would pay dividends for me. I’m 27, with the exception of student loans [taken at the time when pay back costs were less than inflation] have 0 debt, how do i start? Thank you for your kind words about the site. I’m glad you’re finding it useful. At this stage I only have a small amount invested but we all have to start somewhere. Hopefully in several decades I will pat past Nick on the back rather than curse him! Anyway, I also have 12k in a company pension which is in FL BlackRock (40:60) Gl Eq Idx (Aq C) as this seemed the most diverse, yet risky option available. Previously I hadn’t considered to additional skew towards to UK for example (40%) in the BlackRock fund. 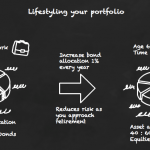 When considering diversification, would you consider your pension separate or include everything in the same picture? If it’s all devoted to the same objective e.g. retirement, then count it all as part of the same picture. Firstly, thank you for an excellent resource regarding passive investing, and for putting me onto Tim Hale’s Smarter Investing – it has been a revelation. I am 40 and want to move my £160k Stakeholder Pension with Standard Life and £27k Hargreaves Lansdown ISA to Interactive Investor. Having done my research, this will be the cheapest platform to execute my 15 to 20 year plan. The plan is to make regular monthly investments into LifeStrategy 80 for the SIPP and LifeStrategy 100 for the ISA. As a passive investor, market timing is not supposed to come into play, however, with the sum of money involved in the SIPP, and the fact that the lion’s share of the investments in the index are riding close to all time highs, would I not be better waiting for the index to drop significantly before dropping the £160k into the fund so that there is room for growth? I have also considered the option of making a replica portfolio of Vanguard ETF’s and just buying the items where the index is low just now (i.e. Emerging Markets), and building the portfolio as and when the time seems more sensible over the next 12 to 24 months. Does this strategy appear sensible? I am also mindful of the fact that the money will not be working for me in terms of dividend yield etc while I wait for the right time to invest, so was considering putting it into a UK Gilts / Bonds fund such as iShares Core UK Gilts UCITS ETF in the meantime, but I am worried about the short term ‘eggs in one basket’. I would appreciate your take on this strategy. The question you need to ask yourself is: how will you know when the right time to invest is? If you’re sitting in cash or bonds and the market is going up and away from you, what will you do? Make good the mistake knowing you’ve missed a chunk of growth or double-down and wait for the market to bend to your will? If the market lurches down, will that be the right time to invest, or will you decide that further falls must follow? 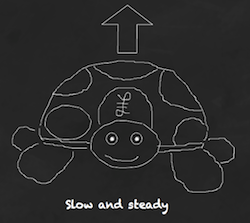 It’s the impossibility of forecasting future market movements coupled with human instincts that tend to fail in the face of investing dilemmas coupled with the plain fact that markets trend up over time that drive the passive philosophy of ‘devise your plan and then stick to it’. Essentially your plan is based on a gamble dressed up as prudence. But, it’s completely normal to feel queasy at moving enormous amounts all at once. If it’s currently invested and you can transfer it ‘in specie’ then why change that? But if during the process you end up in cash and can’t overcome the psychological hurdle of reinvesting in one go then try doing it in stages: e.g. 25% a time for the next 4 quarters. @Accumulator, thanks for your reply. While I agree in most part with what you are saying, I feel that it is possible to make certain educated gambles on what may happen. Looking at the S&P 500 chart over the past 20 years and it is plain to see that we are riding the crest of a very big wave, the size of which has never been seen in it’s history. Based on the fact the lions share of the the world trackers / ETF’s are invested in this market, and that we are the end of 7 years of developed world QE, with rock bottom interest rates, and I feel that it stands to reason that a correction is soon to come. If nothing changes then I am happy to take the passive route with my regular investments in the meantime. But, I think holding the sizeable lump sum as cash / bonds in the short term (1 year) is a prudent gamble. Thank you for the heads up re. II. Based on the fact that they have been around a while and recently updated their pricing, I hope that they are a reasonable bet for the foreseeable future. 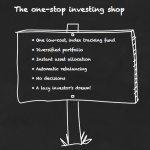 Using their regular investment plan keeps things as cheap as possible with a £150k+ portfolio. Selftrade do look good, but as @TheRhino mentioned in your comparison post, they have been bought by Equinti with a promise to hold the current pricing structure for 12 months. Good luck to you, Grant. You are right that it is a gamble. It’s not passive investing. If you accept that you don’t have edge then the logical conclusion has to be that the risks you list are already known to the market and baked into the price. The US may well just dish out anaemic returns for the next 10-years rather than crash. It may well crash but for reasons as yet unknown, or hits the skids beyond the next 12-months, just after you’ve got in. Perhaps the US defies expectations or is balanced by results in the rest from the rest of the world. The market is littered with the bones of investors who believed the market was bound to unfold as they expected hence the old quote: the market can stay irrational longer than you can stay solvent. Just one example: commentators have predicted rising interest rates since 2009. Still hasn’t happened. Anyway, I do wish you well. You do face a tough decision and I appreciate that. Let us know how things turn out. I have read Tim Hale’s book. I have read many posts on your blog. I have read many other websites. In my mind the logic cannot be argued with – passive investing is the way to go. I think I just need to jump in and see it through. Of course, even that is a magnitude more complex than just using a Lifestrategy fund. Thank you for your thoughts @TheAccumulator. Most appreciated. I have spent some time thinking this all through and I will go with a drip feed into the LifeStrategy fund alongside my regular investments. Thank you once again for your input, and keeping this blog running. I notice that HSBC have released their “HSBC Global Strategy Funds” which are built on passive funds. There are “Cautious”, “Balanced” and “Dynamic” versions containing 25/75, 65/35 and 80/20 allocations respectively. The OCF is between 0.17% and 0.20% and rebalancing is done quarterly. Just wondering if anybody has any thoughts on using these in addition to the LS funds, for diversification? · I have been told that for a single portfolio on Lifestrategy, with a single entry the best course of action is a platform with an annual flat rate if the investment is over £20K. Is that true? (pe. Halifax´s Share Dealing is £12,50 per year against Hargreaves & Lansdown´s approx 0,70% per annum). Well done on tucking some money away. I was a bit older than you before the penny dropped for me. When you open an account with your broker you’d normally move cash in with a debit card. I guess that sort of money could set off alarm bells so probably a good idea to ring up the broker and talk it over. To a new person investing initially sounds quite simple but the more you read the more complicated it gets! Whatever you want to and however you want to invest things get very complicated when trying to find the cheapest broker. –	Question:	Is there a way to avoid the ‘middle man’ broker and invest directly with the Index Fund or ETF? From all the things I’ve read on this blog it is suggested that the best thing a lazy, virgin investor should invest in an All World Index. The problem with this is that Vanguard doesn’t do any All World Indexes, only an All World ETF and I understand that there are reasons not to use ETF’s although I’m not sure exactly why (I heard from one person that ETFs track daily moves then reset each day which can mean that if the market goes up 20% you only end up with 10% of the move). They don’t include emerging markets so you would need to purchase a tracker for that. You would also need to buy some bonds if you didn’t want 100% equity. –	Questions:	Are emerging markets covered? This means that perhaps a Vanguard LifeStrategy Fund should be the next best call but the problem with this is that it doesn’t replicate the market and has a home bias (too high an allocation of UK shares). Also it doesn’t cover commodities, property, and small-cap and value shares. Do I have everything right and does that about sum the basic options up? Vanguard’s All World ETF and LifeStrategy funds both contain a small amount of emerging markets and small cap in so far as they’re captured by their indexes. That’s not the same as a small cap tilt though where you invest in a small cap fund to push your portfolio towards an asset class that has historically earned superior returns than the plain market (sometimes, maybe, not guaranteed. Do more research). Your separates portfolio misses emerging markets. Lifestrategy has some property exposure in so far as REITs are part of the broad market index. Don’t worry about commodities, small cap or value until you’ve done much more research – even then they’re a complication that’s not for everyone. I have a request for an article! I am passive and totally lazy and want my cake and I want to eat it now. In the various articles you cover a massive range of investments, but some, like ETF’s are simply not lazy enough for me as they require me to do stuff like re-invest dividends and do balancing and stuff. Couple of fund examples for me are HSBC’s FTSE 250 ACC, Blackrock Global Property and Blackrock Natural Resources. (I had a hard-on for BHP in the 90’s and can’t seem to kick it, even if I am a bit wiser about the medium these days!) I wanted the latter two to diversify into some cyclic’s beyond the ‘general’ equity sphere (my vanguards are lifestyle 80% and US equity ACC’s) even though I have kind of double bubbled, I can live with it! I was also wondering about how using something like Moneyfarm compares with just buying Vanguards LifeStrategy if you are investing say £5,000. Any amount below £10,000 is fee free so going with them saves you the 0.25% or so platform fees and then you can transfer out once you are above £10,000 and they start charging 0.6%? I know that a 60/40 equity/bond split was the traditional recommendation (thus Vanguard LS 60%) but now that bonds are so expensive, should the Vanguard LS 80% (with only 20% bonds) really be the ‘default’ option? I have been convinced by the passive investing arguments and in particular I’ve found this site very helpful, so thatnkyou muchly for all the helpful advice and articles. The life strategy funds have been a godsend to me as I’m just not that interested in learning everything possible about the market. On the other hand I’m very much in favour of saving up for the future. I’m now wondering though if the Life Strategy is diversified enough or maybe too heavily weighted ot the UK? I am British but expatriated in the EU. Given both Brexit and our family situation I think it is very unlikely I will be moving back to the UK any time soon (or ever) but I still have investments in the UK and I have so far been continuing to invest some other income into lifestrategy funds in the UK via a UK online broker. Given the likely change in our plans I’m now not sure if I should move some of that into an equivalent here or even if there is an equivalent based here? It seems that Vanguard’s standard indexes are available but not the lifestrategy funds. (I’m happy to be corrected on this if anyone knows differently), in which case I could imagine buying into an extra index based on Europe ex UK for example. Whether overweighting the UK proves to be the right call or not though, that’s a crapshoot. Equity returns and economic performance are poorly correlated. Valuations and expectations are stronger drivers e.g. if everyone sells the UK market cos they expect it to underperform – driving prices down – then it’s entirely possible to do very well – i.e. you buy UK equities on the cheap and then the UK does better than expected. A World ex-UK fund is the obvious rebalancing tool, but if you wanted to introduce a different kind of home bias and that home is likely to be Europe then, yes, Europe ex UK makes sense. Thanks for the reply – that’s very interesting – so the home bias is deliberate for marketing purposes basically then? Does it also partly reduce the effect of currency shocks perhaps? I clearly need to do more research! I have bought into passive investing and have a chunk of money in Vanguard Lifestrategy. I have just come into some money and would like to invest more ~£100k. Clearly my hesitation hasn’t helped as VGLS has rocketed further due to the falling pound. I feel I do need to jump in ASAP but see future currency corrections as a worry. Is there a way I can hedge the currency risk of the pound recovering in the future (such as shorting the pound?) which I can buy for the long term with minimal cost (and hassle)? What options are open to me? If you were previously a 60:40 kind of a guy but are worried about bond risk then take a look at shorter-term gov bond ETFs (there aren’t any fund equivalents) rather than cutting back the allocation by 20%. Shorter-term bonds are less volatile in the face of interest rate rises. Hi, some very interesting reading here especially when sat in a very quiet office at work on a Saturday morning! I am an absolute beginner in terms of investment. I am interested in the LS 60/80. Currently I have a small amount ( 8k ) in a cash ISA and thus not a very good return ( £7.50 a month ) I have spoken with a IFA who says I should switch to stocks and shares isa with standard life. For this they want to charge me an initial £300 and then 1.19% ( i think ) per annum. Does this sound good and are these fees fair? I thought an initial £300 at nearly 4% of my pot was very high – would I get this back in 1 years interest?! Would I be better off buying LS 60 or 80 myself thru a platform like HL? Those fees are very high and you’d need to know whether that’s all the fees you’re buying. Have they for example counted the fund manager’s fees too? If you bought from say Cavendish Online, you’d pay 0.25% (platform fee) plus Vanguard’s fund fee, so around 0.55% per year. If you consider that LS 60 might be expected to make a 4% real return per year (on average, over a long period of time, and no guarantees) then you’d be giving up more than 25% of your returns to your IFA and Standard Life. That’s a huge chunk and helps illustrate why it’s so important to minimise the fees you pay. Thank you for your reply & the additional reading. I will have a good read over the weekend. I thought those charges sounded expensive but it’s great to hear your thoughts. Has anyone had any experience with moneyfarm? Looks to be an interesting option for newbies like myself with almost being a half way house between using an IFA & sorting things out yourself? Any thoughts great fully received! I am thinking about investing 8k into Vanguard Lifestrategy 80% and drip-feeding £100 a month into it for say the next 10 years. Is this wise or can anyone recommend using other Vanguard funds to give a better overall return. Having tried active funds before, I found that I meddle and now want a simple investment life and I can check on once a year and let it do the re-balancing for me. I’ve recently started building a small portfolio and have found the advice on this blog invaluable so thanks for all of your great work. I have just bought a range of equity index funds so far as it’s taken me a while to get my head around bonds. Following a comment on one of the other articles I am thinking of using Vanguard Lifestrategy 20 to cover my bond allocation (I would use a lifestrategy fund with 100% bond allocation if this existed). I notice their bond allocations have changed quite a lot since this article was written with much smaller allocations to gilts, especially index linked, and the greatest allocation now being to global bonds. Does anyone know if the global bonds are hedged to sterling? I would rather not take on the additional currency risk, especially with the pound currently so unusually low, but I can’t seem to find any information on this in the Vanguard literature. Incidentally does anyone know the reason Vanguard made these changes? I wanted to avoid allocating too much to gilts due to concerns I’ve seen raised about there being a bubble and also due to the long duration of index linked gilt funds so I wondered if the changes were based on similar thinking. They are listed as hedged. Principally they’re attracted to greater diversification and avoidance of country-specific shocks. For example, raging inflation in the UK could badly damage gilt returns while the rest of the world experiences kinder conditions. Thanks for the links. I’ve decided to follow their thinking re global diversification with bonds (+ also influenced by your recent article on index linked gilts). I’m going to allocate 1/3rd each to UK Gilts, Global bonds and Global inflation linked bonds. I decided against LS20 in the end as fees are higher and it doesn’t really simplify things if you have to take into account the 20% equity too. I’m just looking for a value equity fund now to complete my portfolio and then forget about it. I can’t find anything other than ETFs (my portfolio + monthly allocation is too small to warrant the dealing fees) or Dimensional funds (I’d prefer not to go through a financial advisor). Does anyone know of an OEIC value fund? If not I’ll probably stick with what I have until my portfolio is big enough to make a VVAL ETF worthwhile. That’s a lot of work for a small portfolio and may well take you below minimum contribution levels on your platform. Another option is to invest in Vanguard’s Global Small Cap fund. It’s not value but does expose you to a risk factor. There may well be a global value fund somewhere among the active set and available for a cheapish price. I’ve rooted around before and not come up with anything I liked but you may do better. I’ve been tracking the Vanguard Lifestyle 80 options in my watchlist for the last few days and am about to jump in. Today the accumulator version is down -1.85% but the income version is up 0.41%. Can someone explain this difference? I understand that one pays out dividends and one reinvests them but if anything I’d have thought the former would therefore grow in capital value? Thanks. Take a look at the difference over the last 3 years or 5 years. Difference over a couple of days – doesn’t matter. I’m more just curious about the mechanics. I assumed both funds would have identical holdings and so would rise and fall at the same time. But is this not the case? Am I also right in thinking that their price isn’t linked to the demand for the fund, like it would for an individual stock, but for the value of the underlying indeces they are tracking? Thanks. They should be identical and this has come up before but I can’t remember the details now. Could be some minor difference in dividend treatments or dates or the measurements being taken at slightly different times. You’ll often be able to find different results for a fund just by looking at different sources. Thanks for the article – very interesting. I’m just starting to dabble in investing after having sat on low interest savings accounts for the past 10 years. An interesting point on Vanguard Lifestrategy Vs moneyfarm. Appears that they essentially do the same ‘job’ (albeit with different asset classes) but Moneyfarm has no fees depending on amount invested. Any comment on the two different strategies? The returns chart on VG 80/20 acc is showing a return of 27.48% for year March 2016 to March 2017. At the risk of sounding stupid, is this figure from inception as I’m in the fund for the past year and the returns are no where near this figure. Previous post: Which iPhone 4S deal is the best?